Its summertime so that means spending time with my punahele. We are getting ready to leave the post office and she is playing with my iPod as she loves to do (normally to pick songs) and she decides to play with the timer. We are almost home when she says. G: “Ok you have 4 mins and 40 seconds to get home. We just pulled into our driveway. Me: “How long id dit take us to get home? Technically it is below 3 mins but I let this slide and got smart by recording the rest of the conversation. Me: Yes you are right. So when I cut it in half the first time how many pieces does that make? Me: Right so then you said I cut it in half again? How do you know it is half again? N: Because it is 2 more equal pieces that you cut it into. M: Ok, so then what do I do? N: You cut those pieces in half again. And you do the same thing to the other half of the orange. N: Yeah see you did the same thing. So you come out with 8 pieces of oranges. M: So what does that mean about the “size” of this smallest piece of orange? N: **thinking** It is the same size as the others. M: True it probably is very close to being the exact same size. What about what fraction of the orange is it? N: Oh, it’s one eighth. N: Because there are eight pieces and this is one of the eight. So this is 1/8 of the orange. M: How do you know? I don’t see 4 pieces. N: Because if you did the same thing to the other half you WOULD have 4 pieces. so one of the oranges would be 1/4. M: How do you know? N: Cuz it’s the same as I said before but with more pieces. You are just doing the same thing to both halfs of the orange. 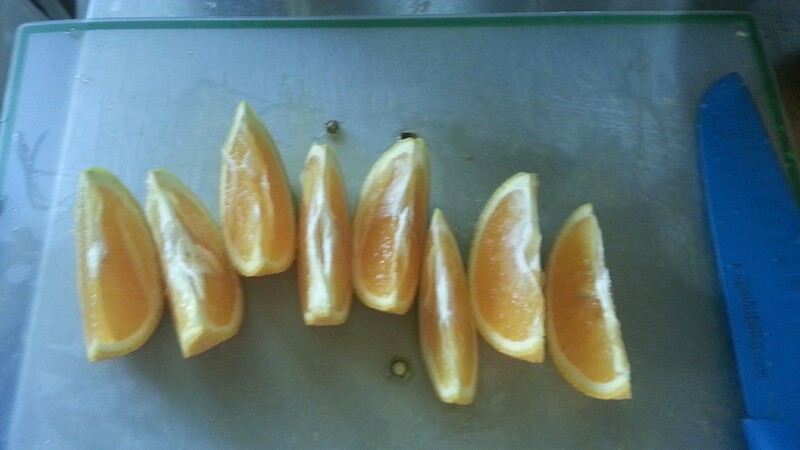 So each orange is making eight pieces. M: Ic, so how many pieces would 2 oranges make? M: Ic, you like doubles yeah? N: Yeah, doubles are easy. 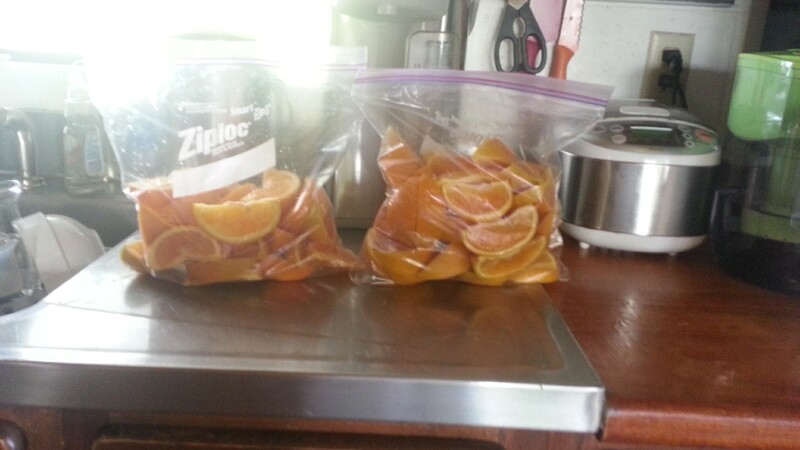 Orange cutting was completed and we put them in our ziploc bags. I asked her to take pictures of the ziploc bags and our eighths.